If you’re navigating your way through autism, chances are you’ve heard of sensory processing disorder (SPD), which is a neurophysiological condition in which the brain struggles to appropriately interpret and process information that comes from the body’s senses. It can cause some people to be overly sensitive to stimuli, and in others, it can make them under-sensitive. It can affect one sense or many senses, and since it’s not included in the Diagnostic and Statistical Manual (DSM), it’s difficult to help children who are affected by SPD. But that doesn’t mean there isn’t ample help available to children affected by SPD. Quite the contrary, actually. If you have a child with sensory processing disorder and have the privilege of speaking with an occupational therapist (OT) about some of the stimuli your child struggles with, you will be amazed at all of the different sensory input tools and tactics he or she can try to help your child receive, process, and respond to sensory information more appropriately, and you’ll probably be given a list of sensory diet activities for your child to complete at home and/or at school. children can learn how to interact with their environment in an appropriate way, and since most sensory diet activities are extremely fun, the child is able to practice her new skills in a non-threatening environment without even realizing it. Does my child need a sensory diet? Unfortunately, the answer to this question isn’t as simple as I wish. Why? Because even though we are all experts when it comes to parenting our own children, the truth is that most of us aren’t qualified in the world of occupational therapy. So if you suspect your child has sensory processing challenges – or if you have a confirmed SPD diagnosis – I highly recommend you reach out to an OT who can best direct you on whether or not your child can benefit from a sensory diet, and which sensory diet activities to focus on. Does she need physical, tactile, visual, oral, or auditory input, or a combination of 2 or more of these kinds of activities? With all of that said, parents and teachers are usually the first people to notice when something is amiss, and if your child seeks sensory input or tries her best to avoid it, a sensory diet might be good for her. Sensory-seekers may have difficulty sitting still, have impulsive tendencies, and seem restless, while sensory-avoiders may seem tired, lethargic, and have difficulty sleeping. Whether your child has a confirmed SPD diagnosis, or you just suspect she has sensory processing challenges, an OT will be able to direct you on how you can help your child cope. Having worked closely with an OT for the greater part of the last year, I wish all parents of children with sensory processing challenges had unlimited access to occupational therapy both at home and in the classroom. It can make such a difference in the lives of children and parents, and since the techniques used are fun and non-threatening, children can tackle even their most difficult challenges without feeling scared. Unfortunately, occupational therapy can be extremely expensive, making it a luxury many parents of special needs kids simply cannot afford, but there are tons of resources available to help children affected by sensory processing challenges and I’m so excited to share some of my favorites with you. I’ve read countless articles and recommended sensory diet activities written by occupational therapists online, and found a fabulous series about sensory processing disorder written by 2 of my favorite bloggers – Dayna from Lemon Lime Adventures and Lauren and Claire from The Inspired Treehouse. Here are my favorite resources to help you understand and help your child with sensory processing challenges. Please note that I’ve also included a list of 33 of my favorite sensory diet activities at the end of this post! Sensory Processing Disorder 101: Sensory Smarts is a fabulous resource for parents, caregivers, and teachers. Created by Lindsey Biel, OTR/L and Nancy Peske, who are co-authors of the book, Raising A Sensory Smart Child, the Sensory Smarts website has all of the information you need to know about sensory processing disorder, including symptoms and checklists as well as strategies to help you pinpoint your child’s individual sensory struggles. You’ll also find practical solutions for common challenges like toothbrushing, haircutting, and bathing, as well as activities you can use at home and in the classroom to set your child up for sensory success. 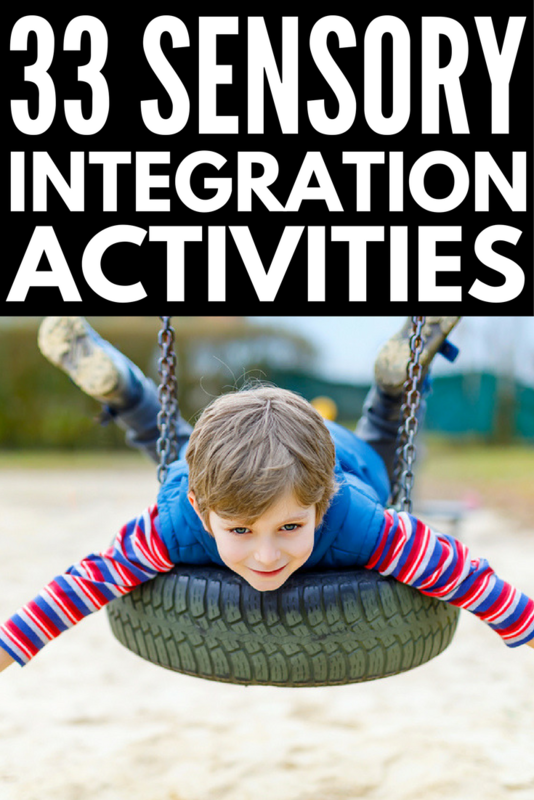 Proprioceptive Challenges: Lemon Lime Adventures has a fabulous list of proprioceptive sensory integration activities designed to help the body accurately sense where it is in relationship to its surroundings. The article does such a fabulous job of explaining the importance of our proprioceptive system and why proprioceptive input is so important for children who struggle with body position. Vestibular Challenges: If your child struggles with balance and movement, Lemon Lime Adventures also has a great article complete with a fabulous collection of activities to teach you all about the importance of the vestibular system. Tactile Challenges: If your child has tactile sensitivities (think: textures, temperature, vibration, pain, etc. ), consider some of these tactile sensory integration activities from The Inspired Treehouse to help teach your kids to understand which tactile stimuli are important (the feeling they get when they cut their finger) and which aren’t (the feeling of the tag on the back of their shirt). Auditory Challenges: Lemon Lime Adventures has another great article that is all about the auditory system as it relates to sensory processing order, as well as activities designed to help teach kids which sounds are important (the sound of mom calling your name), which ones keep us safe (fire alarms), and which ones we should ignore (the hum of the fridge). Visual Challenges: For visual sensory integration activities, The Inspired Treehouse does a great job of explaining what a healthy visual system looks like and how to help a child who has problems with visual processing through fun games and activities you can play at home. Olfactory Challenges: If your child struggles with smells, The Inspired Treehouse has a great post about the olfactory system as it relates to sensory processing disorder. I especially like the toy recommendations she makes as they provide a fun, stress-free way for kids to explore their sense of smell. Oral Challenges: I really love this article about the oral system and sensory processing disorder by Lemon Lime Adventures as it helps explain why some children have the intense need to taste EVERYTHING they come into contact with and offers simple strategies to try and curb unwanted behavior. Here are 33 of our favorite sensory diet activities! For more proprioceptive activities, CLICK HERE. For more vestibular activities, CLICK HERE. For more sensory activities, CLICK HERE. Whether your little one has been diagnosed with sensory processing disorder, or you have noticed she seeks or avoids sensory input, a sensory diet can help correct sensory imbalances for greater focus, concentration, and learning. This collection of sensory diet activities for kids offers a fun, non-threatening way to help develop a child’s motor needs while also having a ton of fun at home and in the classroom. If you found this collection of sensory diet activities helpful, please share this post on Pinterest! And if you’re looking for more ways to help your child, please follow our Autism board where we share all kinds of great tips and tricks!